Hotstar is the Indian equivalent of Hulu in the US or BBC iPlayer in the UK. 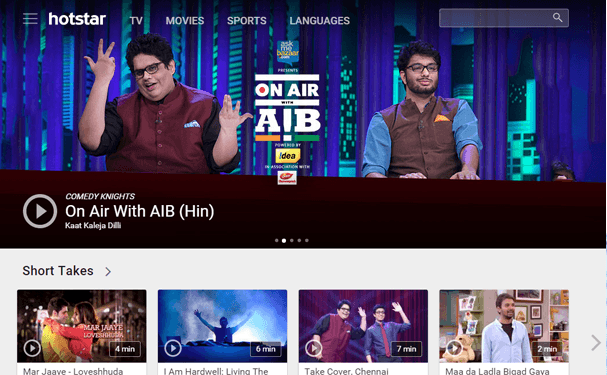 An online streaming service full of Hindi, Tamil, Telugu and English programming. There is absolutely tons of quality Indian TV shows and shows from around the world on Hotstar making it a great resource for those looking for Hindi and other Indian language programming but also offering a good selection of English content too. From English Premier League Football to Hindi movies like Hero, Bajrangi Bhaijaan, and Julie, Hotstar really has something for everyone and if you’re an Indian expat or descendant or even if you’re not Indian at all then Hotstar is definitely worth checking out. The problem is Hotstar isn’t officially available outside India so if you try to watch then you’re blocked. In this guide I’m going to look at how to watch Hotstar in the UK and show you a simple way on how to unblock Hotstar using a VPN, the guide is also suitable for other countries too. So let’s get started. Hotstar only has the rights to show programmes, sport and movies in India and for this reason they block you if you try to watch outside India. When you visit the Hotstar website and try to view a video it automatically checks your location from your computer IP Address and when it sees you’re not in India it hits you with a block message similar to the one below. If you’ve visited Hotstar outside India then you’re probably pretty disappointed that you got blocked from viewing. Luckily a completely legal tool called a Virtual Private Network (VPN) allows you to change your IP Address to an Indian one and watch Hotstar anywhere. VPN services are provided by companies called VPN providers. A VPN firstly encrypts your internet connection and then disguises your IP Address making it appear as if you’re in another country. In the case of watching Hotstar, you want to appear as if you’re in India and then you’re able to watch anywhere in the world outside of India. I’ve spent the past few years reviewing VPN services so have found out which are the best and which are best avoiding. There is so much choice in the VPN market these days that the choices are confusing. Most importantly you need a VPN that is fast because you’re going to be streaming Hotstar from India to wherever you are in the world. 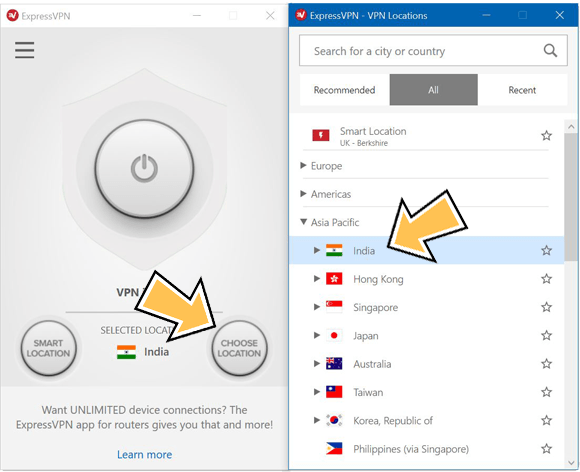 Secondly you need a VPN provider with a connection point in India. This is more difficult to find as not many providers offer Indian locations and some that do are just too slow for video. I’ve been testing the best VPN to watch Hotstar in the UK and elsewhere and put together my three top choices below. A VPN service from my recommended provider ExpressVPN costs US$6.67 per month when taking a yearly account which is roughly about £4-£6. You can also pay monthly at a slightly higher cost, but it still works out cheaper than the other two options. With speeds being the fastest I’ve seen from an Indian connection it allows watching Hotstar in the best available quality without buffering. VPNs work on all devices so if you have a PC or Mac then you’re good and even if you have an Android or iOS tablet or phone then you’re also covered. All three suggested providers above offer easy to use software and apps that are really easy to use and self explanatory. If you’re worried that it’s going to be difficult then don’t. All it takes on a PC or Mac is one or two clicks and you’re good to go and the mobile apps are even easier to use. All you need to do is connect to an Indian “server” on the software from the VPN provider and once it has connected you visit the Hotstar website. 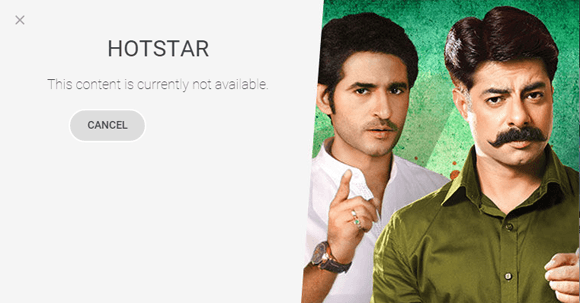 Now Hotstar thinks you are in India even though you’re in the UK or elsewhere in the world and rather than be blocked by the two angry looking guys you’ll be able to watch all the freely available shows, movies and even EPL and Indian football. In the example image below, it shows how easy it is to connect using the ExpressVPN app. Don’t forget all you need to do is sign up to one of the VPN providers above and the rest is simple!